Willy Stöwer (22 May 1864 – 31 May 1931)  was a German artist, illustrator and author during the Imperial Period. He is best known for nautical paintings and lithographs. Many of his works depict historical maritime events such as the sinking of the RMS Titanic in 1912. Germans are a Germanic ethnic group native to Central Europe, who share a common German ancestry, culture and history. German is the shared mother tongue of a substantial majority of ethnic Germans. An illustrator is an artist who specializes in enhancing writing or elucidating concepts by providing a visual representation that corresponds to the content of the associated text or idea. The illustration may be intended to clarify complicated concepts or objects that are difficult to describe textually, which is the reason illustrations are often found in children's books. The German Empire, also known as Imperial Germany, was the German nation state that existed from the unification of Germany in 1871 until the abdication of Kaiser Wilhelm II in 1918. For people with the surname, see Wolgast (surname). 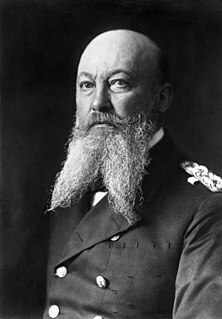 The Navy League or Fleet Association in Imperial Germany was an interest group formed on April 30, 1898 on initiative of Admiral Alfred von Tirpitz through the German Imperial Naval Office (Reichsmarineamt) which he headed (1897–1916) to support the expansion of the Imperial German Navy (Kaiserliche Marine). Specifically it was intended to develop popular pressure on the German parliament (Reichstag) to approve the Fleet Acts of 1898 and 1900, and the attendant expenses. Honorary titles in academia may be conferred on persons in recognition of contributions by a non-employee or by an employee beyond regular duties. This practice primarily exists in the UK and some universities and colleges in the United States, Australia, Hong Kong, and Canada. Commercial art is the art of creative services, referring to art created for commercial purposes, primarily advertising. Commercial art uses a variety of platforms for viewers with the intent of promoting sale and interest of products, services, and ideas. It relies on the iconic image to enhance recall and favorable recognition for a product or service. An example of a product could be a magazine ad promoting a new soda through complimentary colors, a catchy message, and appealing illustrative features. Another example could be promoting the prevention of global warming by encouraging people to walk or ride a bike instead of driving in an eye catching poster. It communicates something specific to an audience. Stollwerck GmbH is a German chocolate manufacturer. It was founded in 1839 and expanded internationally in Europe and America, becoming the second largest producer of chocolate in the United States by 1900. Since 2011 it has belonged to Belgian firm Baronie Group. 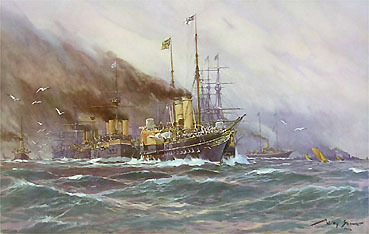 Stöwer's representation of the sinking of the RMS Titanic in the magazine Die Gartenlaube earned him a special popularity. He created the illustration shortly after the disaster in 1912 without detailed information, in particular, the fourth funnel did not eject black smoke as it was only for ventilation. However, the image became iconic despite minor errors and has been reprinted numerous times even to the present day. Stöwer, not known for portraiture, also painted a portrait of the Kaiser in a naval uniform, which along with some of his naval paintings, hang in the Kaiser's Room  at Achilleion, the Kaiser's summer palace from 1907 to 1914  (currently a museum)  on the Island of Corfu. RMS Titanic was a British passenger liner that sank in the North Atlantic Ocean in 1912, after colliding with an iceberg during her maiden voyage from Southampton to New York City. Of the estimated 2,224 passengers and crew aboard, more than 1,500 died, making it one of modern history's deadliest commercial marine disasters during peacetime. 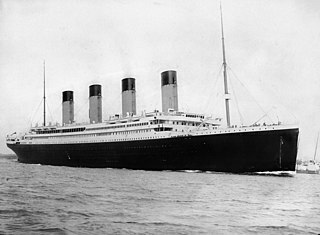 RMS Titanic was the largest ship afloat at the time she entered service and was the second of three Olympic-class ocean liners operated by the White Star Line. She was built by the Harland and Wolff shipyard in Belfast. Thomas Andrews, chief naval architect of the shipyard at the time, died in the disaster. Die Gartenlaube – Illustriertes Familienblatt was the first successful mass-circulation German newspaper and a forerunner of all modern magazines. It was founded by publisher Ernst Keil and editor Ferdinand Stolle in Leipzig, Kingdom of Saxony in 1853. Their objective was to reach and enlighten the whole family, especially in the German middle classes, with a mixture of current events, essays on the natural sciences, biographical sketches, short stories, poetry, and full-page illustrations. Achilleion is a palace built in Gastouri on the Island of Corfu for Empress of Austria, Elisabeth of Bavaria, also known as Sisi, after a suggestion by Austrian Consul Alexander von Warsberg. Elisabeth was deeply saddened by the tragic loss of her only son, Crown Prince Rudolf of Austria during the Mayerling Incident in 1889, and a year later she had this summer palace built in the region of Gastouri (Γαστούρι), about ten kilometres to the south of the city of Corfu in Achilleio. Achilleion's location provides a panoramic view of Corfu city to the north, and across the whole southern part of the island. Oil painting is the process of painting with pigments with a medium of drying oil as the binder. Commonly used drying oils include linseed oil, poppy seed oil, walnut oil, and safflower oil. The choice of oil imparts a range of properties to the oil paint, such as the amount of yellowing or drying time. Certain differences, depending on the oil, are also visible in the sheen of the paints. An artist might use several different oils in the same painting depending on specific pigments and effects desired. The paints themselves also develop a particular consistency depending on the medium. The oil may be boiled with a resin, such as pine resin or frankincense, to create a varnish prized for its body and gloss. The Internationales Maritimes Museum Hamburg is a private museum in the HafenCity quarter of Hamburg, Germany. The museum houses Peter Tamm's collection of model ships, construction plans, uniforms, and maritime art, amounting to over 40,000 items and more than one million photographs. It opened in a former warehouse in 2008. U-boat is an anglicised version of the German word U-Boot[ˈuːboːt](listen), a shortening of Unterseeboot, literally "underseaboat." While the German term refers to any submarine, the English one refers specifically to military submarines operated by Germany, particularly in the First and Second World Wars. Although at times they were efficient fleet weapons against enemy naval warships, they were most effectively used in an economic warfare role and enforcing a naval blockade against enemy shipping. The primary targets of the U-boat campaigns in both wars were the merchant convoys bringing supplies from Canada and other parts of the British Empire, and from the United States to the United Kingdom and to the Soviet Union and the Allied territories in the Mediterranean. German submarines also destroyed Brazilian merchant ships during World War II, causing Brazil to declare war on the Axis powers in 1944. "The military airship 'P II' reports by radio the approach of a Wright Flyer." "Sinking of a hostile armed troop carrier by German submarine in the Mediterranean Sea". "Winter Camp of the Sailors in Wolgast "
↑ Stöwer, Prof. Willy (1916). Deutsche U-Boot-Taten, in Bild und Wort. München / Berlin: F. Bruckmann / Reichsmarinestiftung. ↑ Wislicenus, Admiralitastrat Georg; Stöwer, Prof. Willy (1912). Kaiser Wilhelm II. Und die Marine. Berlin: August Scherl. pp. 207. ↑ Stöwer, Willy (1900). Deutsche Flottenmanöver: Nach Aquarellen u. Studien. Braunschweig: Westermann. ↑ Stöwer, Willy (1898). Deutschlands Kriegsflotte: Mit Benutzung amtlichen Materials nach original Aquarellen. Berlin: Kutzner & Berger. Martin Hinrich Carl Lichtenstein was a German physician, explorer, botanist and zoologist. The Kaiser Wilhelm Society for the Advancement of Science was a German scientific institution established in the German Empire in 1911. Under the Third Reich it was involved in Nazi scientific operations, and after World War II concluded, its functions were taken over by the Max Planck Society. The Kaiser Wilhelm Society was an umbrella organisation for many institutes, testing stations, and research units created under its authority. Aktien-Gesellschaft Vulcan Stettin was a German shipbuilding and locomotive building company. Founded in 1851, it was located near the former eastern German city of Stettin, today Polish Szczecin. Because of the limited facilities in Stettin, in 1907 an additional yard was built in Hamburg. The now named Vulcan-Werke Hamburg und Stettin Actiengesellschaft constructed some of the most famous civilian German ships and it played a significant role in both World Wars, building warships for the Kaiserliche Marine and the Kriegsmarine later. The German Emperor was the official title of the head of state and hereditary ruler of the German Empire. A specifically chosen term, it was introduced with the 1 January 1871 constitution and lasted until the official abdication of Wilhelm II on 28 November 1918. The Holy Roman Emperor is sometimes also called "German Emperor" when the historical context is clear, as derived from the Holy Roman Empire's official name of "Holy Roman Empire of the German Nation" from 1512. Wilhelm von Bode was a German art historian and curator. Born Arnold Wilhelm Bode in Calvörde, he was ennobled in 1913. He was the creator and first curator of the Kaiser Friedrich Museum, now called the Bode Museum in his honor, in 1904. Otto Schrader was a German philologist best known for his work on the history of German and Proto-Indo-European vocabulary dealing with various aspects of material culture, such as the names of domesticated plants and animals, the names of the metals, etc. The Kiautschou Bay Leased Territory was a German leased territory in Imperial and Early Republican China which existed from 1898 to 1914. Covering an area of 552 km2 (213 sq mi), it was located around Jiaozhou Bay on the southern coast of the Shandong Peninsula. Jiaozhou was romanized as Kiaochow, Kiauchau or Kiao-Chau in English and as Kiautschou or Kiaochau in German. The administrative center was at Tsingtau. Friedrich Wilhelm Kuhnert was a German painter, author and illustrator, who specialized in animal images. Christopher Rave was a German painting artist, explorer of polar regions and professor. Gustav Adolf Carl Closs was a German painter, illustrator and heraldist. Hans Bohrdt was a German artist. He was a self-taught painter who would later go on to give private lessons to Kaiser Wilhelm II. German Kaiser Wilhelm II took a liking to Bohrdt and would fund all of his projects, which were often nationalistic in nature. In 1915 Bohrdt created his most famous illustration which is called "The Last Man". The image shows a German navy officer holding up a German flag as his ship sinks because he would rather go down with the ship than surrender. "The Last Man" would become one of the most widely recognized propaganda images used during the war to inspire courage. Bohrdt was accepted into the Imperial Yacht Club in Kiel. In 1906 the Kaiser granted Bohrdt a spacious villa in Berlin. After World War I, Bohrdt made a living drawing maritime postcards, book illustrations, magazines, and supplied images for newspaper articles. Fritz Stoltenberg (1855–1921) was a German landscape and marine painter. After a summer with the Skagen Painters in 1884, he returned to Kiel where he painted and sketched the old town and the harbor, publishing many of his illustrations in local magazines. Johann Arnold Ebert was a German writer and translator. Wilhelm Schmidthild was a German painter, graphic artist, illustrator and art professor. He chose as his field detailed documentation as an illustrator for botanical and zoological reference books and free compositions in the tradition of realism. He is also known as Schmidt-Hild. Johann Oswald Harms was a German Baroque painter, engraver, and the first notable stage set designer of the Baroque. He worked for the Opernhaus am Taschenberg in Dresden, painting the ceiling and designing stage sets. Alexander Kircher was an Austrian-German marine and landscape painter and illustrator. 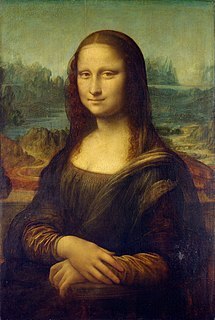 Many of his paintings can be seen in museums in Germany, Austria, Croatia, and Slovenia while others are held by private owners in those same countries, as well as the United States of America, Great Britain, Scandinavia, and Greece. Ernst Victor Keil was a German bookseller, journalist, editor and publisher. His early publications promoted liberal views and satirized famous politicians leading up to the German revolutions of 1848–49, resulting in government censorship and earning him a short prison stay in 1852. He then developed Die Gartenlaube, a weekly illustrated magazine aimed at enlightening and entertaining the whole family, particularly the middle and lower classes of society. It became the first successful mass-market German language magazine. By the time of his death in 1878, Gartenlaube had reached a paid circulation of 382,000 and an actual readership of at least 2 million, making it one of the most widely read publications in the world at the time. Keil's work had a significant and lasting influence on the formation of a German national identity before, during and after the unification of Germany in 1871. ↑ "Willy Stower". AskART. Retrieved 1 May 2012. 1 2 Hormann, Jörg-Michael (2001). Willy Stöwer. Marinemaler der Kaiserzeit. Leben und Werk (in German). Koehlers Verlagsgesellschaft. ISBN 3-78220-822-6. ↑ Rüger, Jan (2007). The Great Naval Game: Britain and Germany in the Age of Empire. Cambridge University Press. p. 207. ISBN 978 0 521 87576 9. ↑ "Liste, Karte, Datenbank / Landesdenkmalamt Berlin". www.stadtentwicklung.berlin.de (in German). No. 09011991. ↑ "Wurzburg, Bayern: Hauptfriedhof". Androom. Berlin: Kirchhof Jerusalem und Neue Kirche III. Retrieved 24 April 2018. 1 2 Petrulis, Alan. "Willy Stower 1864-1931". S - ARTISTS. Metropolitan Postcard Club. Retrieved 4 May 2012. ↑ Image from German Wikimedia Commons: (1900) Sammelalbum Nr. 3, Gruppe Nr. 132; Gebr. Stollwerck Stammhaus: Köln am Rhein. ↑ Μena, Μary. "KAISER'S ROOM" . Retrieved 30 April 2012. ↑ "Achilleion (description)" . Retrieved 27 September 2012. ↑ Seegefecht. Versenkung des italienischen Zerstörers "Turbine" durch österreichische Zerstörer am 24. Mai 1915. Öl auf Leinwand, 50×75 cm. ↑ "Osterwasser- The Legend of Easter Water". German Girl in America. Retrieved 23 April 2018. ↑ "Prints & Photographs Online Catalog / Record". Library of Congress. Retrieved 7 May 2012. ↑ "6 IMPERIAL GERMAN NAVY KRIEGSMARINE BOOKS w/ STÃ-WER". WorthPoint. Retrieved 9 May 2012. ↑ "Digital Library: Der deutsche Segelsport". Hathi Trust. Retrieved 9 May 2012. ↑ "Kurzbeschreibung". amazon.de. Retrieved 10 May 2012.